Covering the products before cleaning the soot and debris above it. 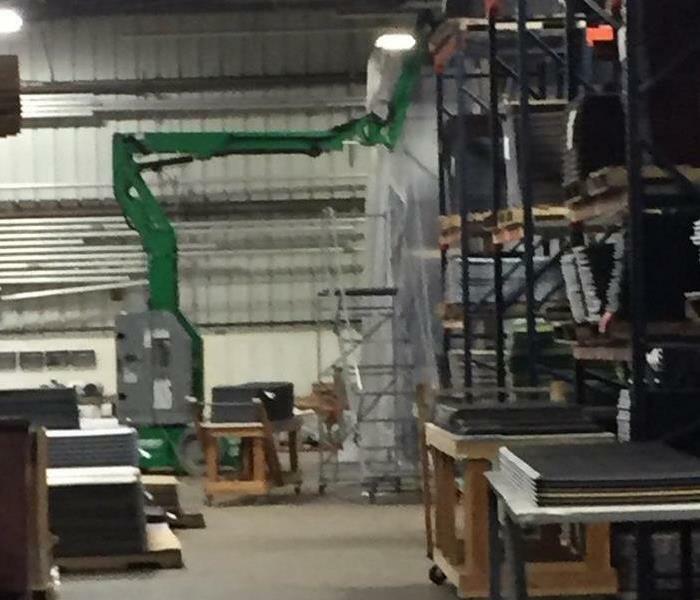 Here our crew covers the customer's product produced after the fire damage before cleaning the soot and debris from the structure above the storage racks. Varying cleaning hours to times when the skeleton crews worked kept production running and no disruption. No product was lost or damaged in the cleaning process. Water beneath an engineered wood floor. Wood floors, or anything that looks like wood floors, are wildly popular in home decorating. Engineered wood floors are nice, higher end floors where the body of the flooring piece is a plywood or layered wood with a veneered wood layer on the top of the piece. 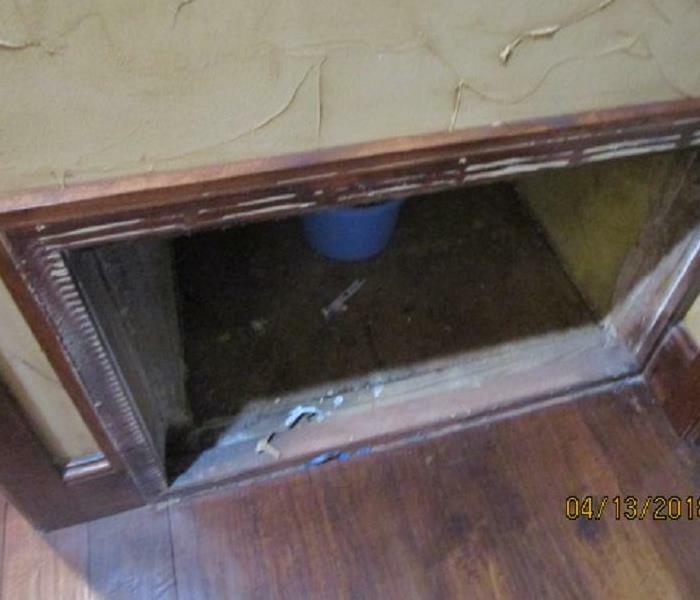 In a water damage, the water can go over the floor and under the floor. The water is absorbed from beneath and through all the spaces between the individual pieces. Often the floor will need replaced. The floor pictured also had a vapor barrier mat beneath it. The water in this case ran over the floor and down onto the mat. The water did not get below the mat to any large degree however. 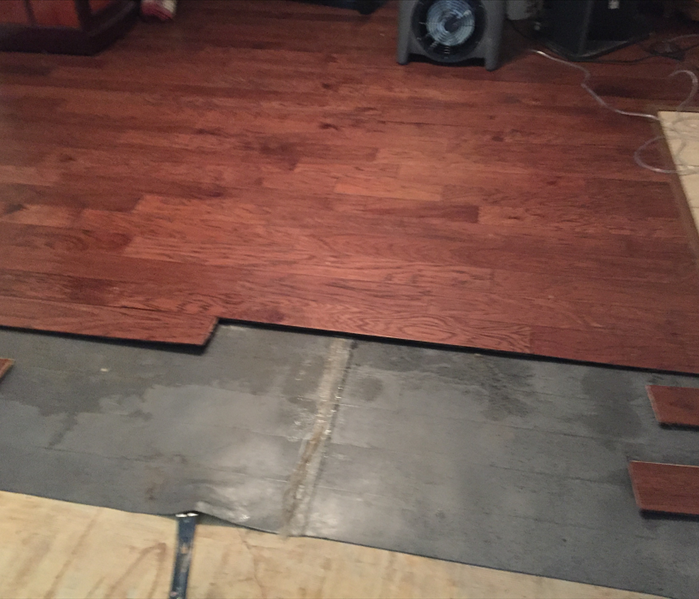 Usually engineered floors are glued down with a honey type glue, and are difficult to remove. Wildfire damage from in front of the customer's home. The fire damage continues off in the distance. In July 2018, we assisted a family whose property was burned in the wildfires between Gatesville, TX and Copperas Cove, TX. The drive out on the country lanes to get to the home was ominous. Everything was burned and fire trucks were still returning to the area to get more water for further up the line. The firefighters did an incredible job saving the family's home from severe damage and saving all the contents of the home. The fields and a couple of sheds did suffer severe damage. 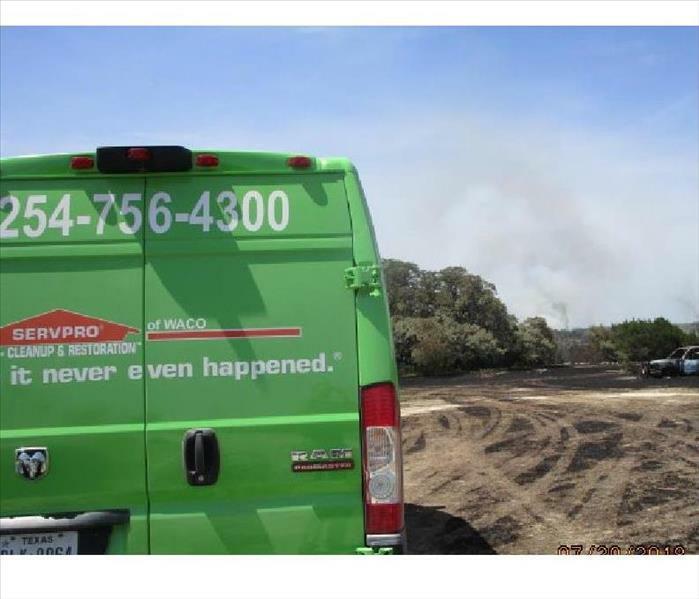 SERVPRO of Waco was able to clean up the fire damage on the inside of the home pretty quickly. Drying wet paneling and the drywall behind can be challenging. Often a water release in a building which has paneled walls will have wet drywall behind the paneling, as was the case in this Groesbeck, TX, duplex. The problem is the water will wick up the dry wall behind the paneling very quickly, as oil wicks up the wick in a lantern. However, the moisture is very slow to wick back out of the wall, down from whence it came or through the paneling as the paneling is drying. Sometimes the drywall will dry behind the paneling using just the drying equipment. Sometimes it is necessary to open drying holes in the both layers (paneling and drywall) of the wall. Sometimes sections, or all, of the paneling has to go. In this instance, we were able to save all the walls intact. A little trim was removed in a few places to open up the walls in those areas. The trim was easily replaced and everything was good to go. 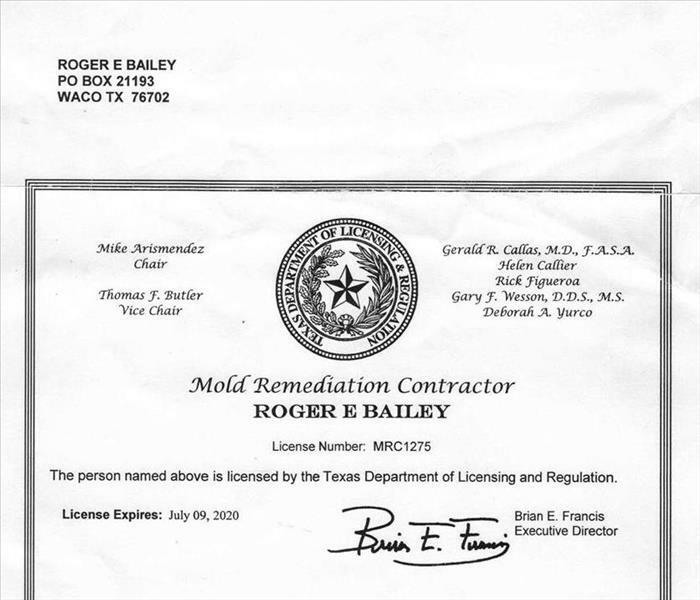 Once again, Roger has been renewed as a licensed Mold Remediation Contractor by the State of Texas. Roger was trained and began mold remediation contractor projects in homes and businesses in 2001. Yes, he was one of the honest ones in that mess back then. With 17 years experience in both residential and commercial mold damage remediation in all of Central Texas, SERVPRO of Waco can help you with any size mold situation in your home or business. Don't get "hyped" by someone about your mold situation. There is rarely any need to flee your home/business, screaming down the street about mold. On the other hand, there can be concerns, some serious, about mold in a building. Give us a call about your mold concerns. There is only one SERVPRO of Waco! "Big whoop" right? But required to maintain our TEXAS MOLD REMEDIATION CONTRACTOR license. That is a "big whoop"... and most don't have one. 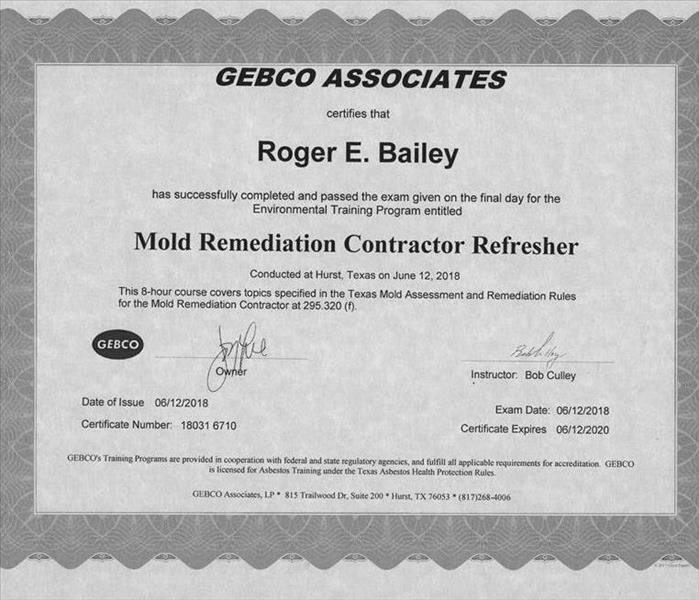 Roger, with SERVPRO of Waco, has completed the Texas mold "refresher" course required for renewing the Texas Mold Remediation Contractor license. Well, it is required every two years to maintain a mold remediation license. Texas mold licenses are required for mold remediation by legislation to protect you,the customer. In the past, many people and companies have been cheated by contractors/companies which were less than honest. At SERVPRO of Waco we've been straight forward and completely honest about mold and remediation throughout our 17+ years serving Waco and many surrounding communities. We are the only mold remediation contractor licensed SERVPRO office within many, many miles of Waco TX. Call us with any questions or concerns with mold or potential mold you have. We'll be glad to assist and guide you in dealing with mold issues. Strategically placed bucket catching water from an AC condensate line blockage in the China Spring area. It can happen with any AC system. It looks like (and feels like) hot humid weather has come early to Waco and Central Texas. It may be a long hot summer. Our air conditioning systems are going to get quite a workout. One problem which pops up virtually every time intense heat arrives and stays is a blockage of the water drain line from the unit inside the building to where it runs out on the ground outside the building. They call this the condensate line as the water is formed from condensation in the cooling process. It can be especially bad if the unit is next to a closet or room which no one enters regularly and can go undetected for a while. You might want to have a look inside the closet/room where the AC unit is located and adjacent rooms. Just to be sure no funny business is going on there. Pull off the top part of the pipe and pour bleach down the pipe at the unit. Plumbers seem to swear by this. Check outside where the line should be draining onto the ground and be sure water is coming out and it is not blocked...or in the ground! Should you find water damage in your building leaking from the AC system, call SERVPRO of Waco to get it extracted and dried properly in Waco and Central Texas. Sometimes mold is on things as small as splatters on walls in Waco. We like to use the example mold won't grow on your car fender, but if you spread butter all over your car fender, it will grow on the butter which is on your car fender. Sometimes this is even true of mold which is growing on something on another material which will also grow mold. 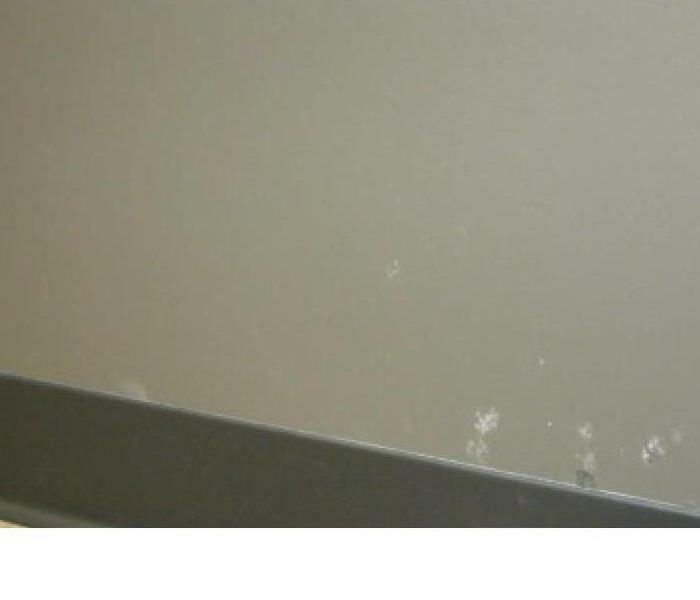 The photo is of a wall in a commercial building, in the Central Texas Marketplace area of Waco, TX, which appeared to have mold on the wall. Technically, that is correct, but actually the mold was on what appeared to be splatter drops from a drop food or drink. The mold was easily wiped off by SERVPRO of Waco with antimicrobial, though the spots from the food discolored the wall. Is there always someone present in your business/facility during working hours who knows how to turn off the sprinkler system should it suddenly open up? Even just one sprinkler head will put out an enormous amount of water very quickly...and over a pretty good sized area. In a fire, that is exactly what you want. Sometimes the sprinkler system can go off for other reasons, or a very minor fire. When they do, they need turned off quickly. 15 or 20 minutes to figure out where and how to turn them off will be a soaking disaster. It is kind of easy to forget who knows, especially if there is some normal turn over in personnel. Can even happen when the boss, or whoever, is out of the building briefly. It kind of goes in there with knowing how to cut the water off to the whole place and cut the power off. It is a fine line to be sure the facility is safe from someone using these for harmful purposes and still be sure the utilities can be stopped quickly in an emergency. It may come down to who also knows where the keys are if locking the utilities is deemed necessary. Knowing where and how to turn off the water can be a big deal in even small offices/facilities if things go haywire suddenly. 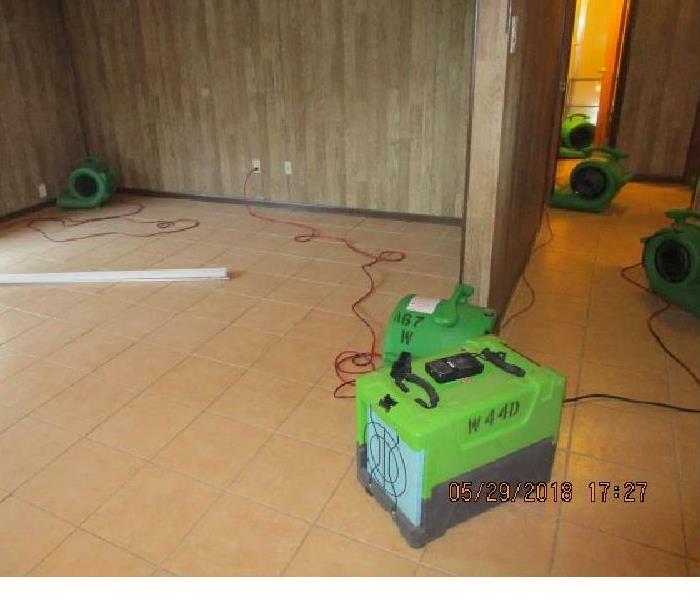 SERVPRO of Waco has helped folks get this type of water damage cleaned up quickly and their businesses to keep running or re-open quickly. 5/25/2018 - Sometimes mold is on things as small as splatters on walls in Waco.